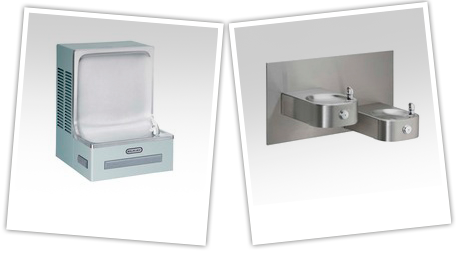 When should you call Felco Air Conditioning, Inc. about your water cooler, drinking fountain, or chiller? If the waters not cold - give us a call! If the waters not coming out - give us a call! If the systems parts are broken – give us a call! If the systems parts are missing – give us a call! Our specialty is getting water coolers, drinking fountains, and chillers to cool the water when they have stopped doing so, repair and replace parts that dispense water, and repair and replace parts that are cosmetically broken or missing. We are factory authorized to do warranty repairs on Elkay, Halsey Taylor, Haws, Oasis, and Sunroc. Our trucks are stocked with parts so that most repairs can be done on site. We service all of Miami-Dade County. Please call us and we will help you in any way we can. If you call us with the Model and Serial number of your water cooler, drinking fountain, or chiller, we can tell you how old it is and if it is still under warranty. Where is the Model and Serial number? If you have a water cooler or drinking fountain that is wall mounted, the model and serial number are usually on a sticker under the system. No panels need to be removed and no tools are needed to read the model and serial number. If you have a water cooler or drinking fountain that is free standing ( also known as floor model), the model and serial number are usually on a sticker on the side of the system. No panels need to be removed and no tools are needed to read the model and serial number. Is there a Service Call charge to check the system? Yes, there is a $75 service call charge to check the first system and an additional $35 to check each additional system at the same location. The service call charge does go towards the repair of the system if you chose to do the repair. If the system is non repairable or you chose to not repair it, unfortunately, we do still have to charge you the service call. Do you replace or install water filters?